Topics: Buy Now, Warranty, - Education, - Business, - Church, and - Multi-use. The site has about 445 users daily, viewing on average 2.30 pages each. 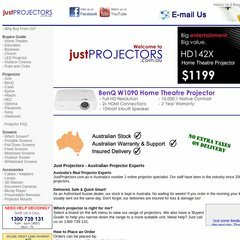 Justprojectors.com.au's IP address is 203.123.59.80. There are 2 Nameservers, ns1.digitalpacific.com.au, and ns2.digitalpacific.com.au. It is hosted by Digital Pacific Pty Ltd (New South Wales, Sydney,) using Apache web server. PING www. (203.123.59.80) 56(84) bytes of data. A ping to the server is timed at 197 ms, and the average page load time is 1673 milliseconds.